Graduated among the top of his class from the University of Baja California in the year 2005. He completed his internship in Tijuana at Issstecali Hospital, where he served as Chief Intern and was awarded “Best Intern” in his class. He then completed a four-year training residency in Dermatology at the prestigious “Dr. 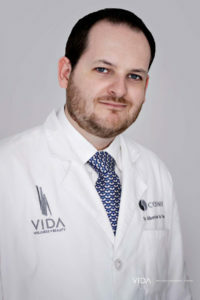 Jose E. Gonzalez” University Hospital from the University of Nuevo Leon in Monterrey, including a year in Internal Medicine. During his residency training, he was named Chief Resident and also awarded “Distinguished Resident in Dermatology” for his achievements, publications and participations in national and international scientific journals and meetings. Completed part of his residency training in prestigious Dermatology rotations such as Scripps Hospital and Clinic in Procedural, Cosmetic and Laser Dermatology, and also at Children’s Hospital San Diego in Pediatric and Adolescent Dermatology. Dr. de la Fuente’s services include peelings (very superficial, superficial and medium depth peels), IPL, Fraxel, Thermage, Cryosurgery, Dermoscopy, Subincisions for acne scars, skin biopsies, Electrosurgery/electrofulguration, Photodynamic therapy, nail surgery and comedone extraction. Certified by the Educational Commission for Foreign Medical Graduates in the U.S.A.